Interview by Jessica Pai. Photo by Unknown. I am a Music Education major at UNLV. An East-coaster at heart I born in New York with most of my childhood split between there and a small town in Vermont. I moved to Las Vegas at the age of 12 where I have been ever since. Transitioning from small town to big city life was fairly difficult in my teen years. I gravitated to music and singing as a coping mechanism during those confusing times. How did you end up at UNLV? I knew at a young age that my career would involve music. To what extent, I wasn’t sure in the beginning. It was in high school, while I was a student aid for my choir director, that I realized my affinity for teaching and tutoring. While performing was invigorating and fun, I found that I was much more fascinated by the pedagogical side of it all, thus I continued on to UNLV to get my Music Education degree. Studying at UNLV has opened up many doors for me in my future career. I get to work with some of the finest Music Educators on the west coast, having just recently finished my teaching observations at Green Valley High School, where I spent the last two semesters observing the Choir, Band, and Orchestra teachers. 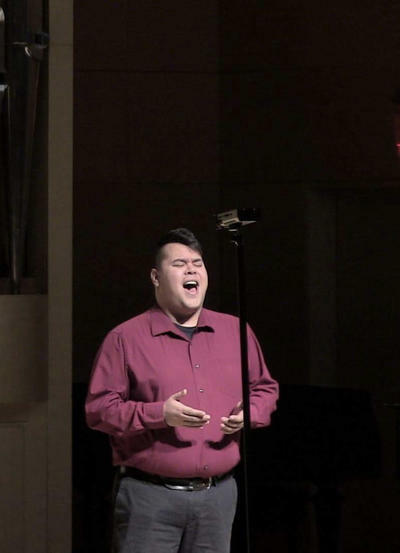 I have also had many performance opportunities while singing with the Division of Choral Studies at UNLV. Last April we performed with the Las Vegas Philharmonic in the Smith Center, where we performed Orff’s Carmina Burana. For our winter concert, Missae et Motetti, the Chamber Chorale and Concert Singers will come together to perform Joseph Haydn’s Missa brevis sancti joannis de Deo, commonly known as the Little Organ Mass. Our other choirs: Argenta, Varsity Glee, and Master Singers will be performing sets as well. We will also be joined by two outstanding high school choirs from Desert Oasis High School and Foothill High School. Our theme for the concert, translated from its title, is “masses and motets,” small works from different periods of music history. It has been an adventure prepping and rehearsing for this concert! With final exams lurking around the corner, it has been a great stress relief to come together with fellow students of all majors and make some beautiful music. As a musician (see: Music Nerd), Haydn’s Little Organ Mass is a bucket list item for me, so it has been an exciting opportunity. It has also been great working with Dr. Joe Svendsen, who conducts Concert Singers and Argenta. Being that I am in the Chamber Chorale, under the direction of Professor David Weiller, I do not get to work with Dr. Svendsen very often. Both directors are outstanding musicians, so I love when I have the chance to work with them both. The choirs have worked hard to put on a great performance, so be sure to come to see it! November 29th in Artemis Ham Hall at 7:30 p.m.